The medulla oblongata (medulla) is one of the three regions that make up the brainstem. It is the most inferior of the three and is continuous above with the pons and below with the spinal cord. The medulla houses essential ascending and descending nerve tracts as well as brainstem nuclei. In this article, we shall look at the anatomy of the medulla – its external features, internal anatomy, and blood supply. The medulla is conical in shape, decreasing in width as it extends inferiorly. It is approximately 3cm long and 2cm wide at its largest point. The superior margin of the medulla is located at the junction between the medulla and pons, while the inferior margin is marked by the origin of the first pair of cervical spinal nerves. This occurs just as the medulla exits the skull through the foramen magnum. Figure 1 – The three major parts of the brainstem. There are several structures visible on the anterior surface of the medulla – namely the three fissures/sulci, the pyramids, the olives, and five cranial nerves. In the midline of the medulla is the anterior median fissure, which is continuous along the length of the spinal cord. However, it is interrupted temporarily by the decussation of the pyramids (see below). As we move away from the midline, two sulci are visible – the ventrolateral sulcus and the posterolateral sulcus. 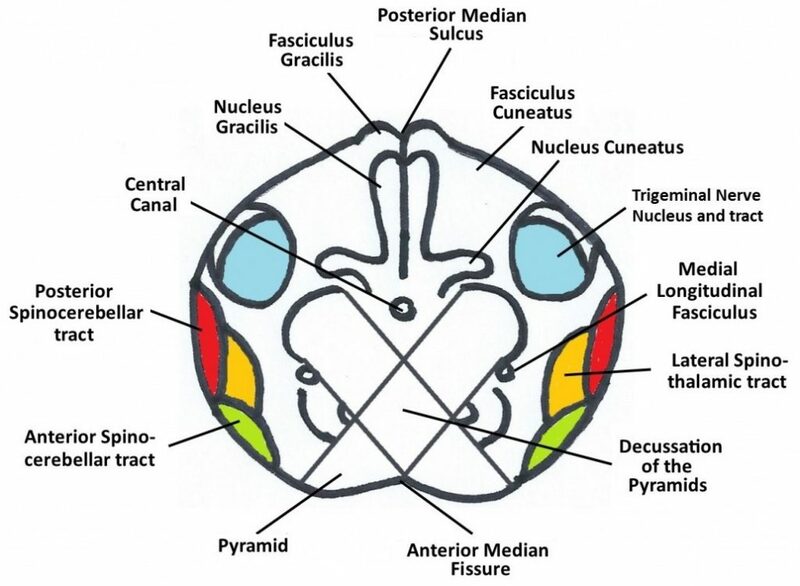 The pyramids are paired swellings found between the anterior median fissure and the ventrolateral sulcus. Information on the pyramids can be found here. The olives are another pair of swellings located laterally to the pyramids – between the ventrolateral and posterolateral sulci. 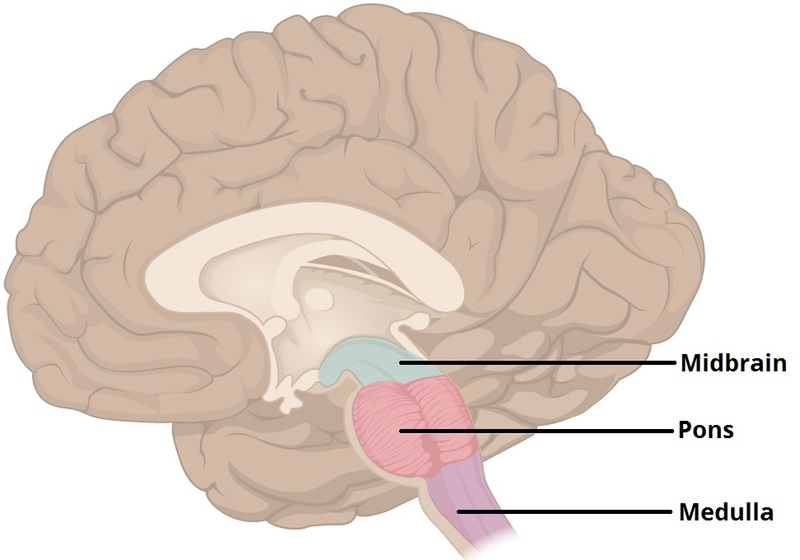 Arising from the junction between the pons and medulla is the abducens nerve (CN VI). Extending out of the ventrolateral sulcus is the hypoglossal nerve (CN XII). In the posteriolateral sulcus, three more cranial nerves join the medulla (CN IX, CN X, and CN XI). Further information on these nerves appears here. Fig 2- Anterior surface of the medulla. Unlike the anterior surface of the medulla, the posterior surface is largely obstructed from view and is relatively devoid of features. In order to appreciate the posterior surface, the cerebellum must be removed. Similar to the anterior surface, the posterior surface has a midline structure – the posterior median sulcus – which is continuous below as the posterior median sulcus of the spinal cord. Above, the sulcus ends at the point in which the fourth ventricle develops. As we move lateral from the midline, the fasciculus gracilis and fasciculus cuneatus are seen, separated by the posterior intermediate sulcus. 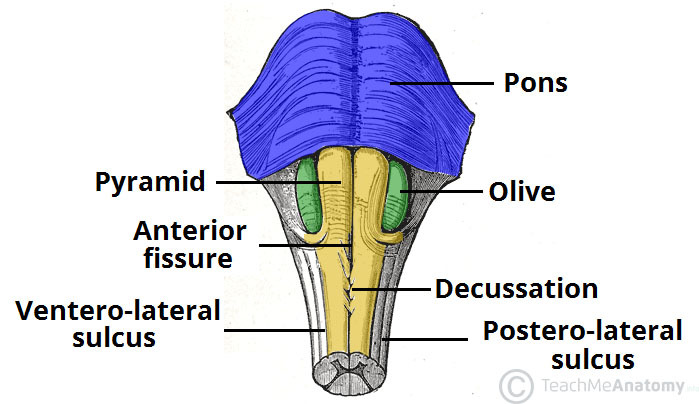 Fig 3 – The posterolateral surface of the brainstem. The medulla itself is typically divided into two regions: the open and the closed medulla. This distinction is made based on whether the CSF-containing cavities are surrounded by the medulla (closed medulla) or not (open medulla). 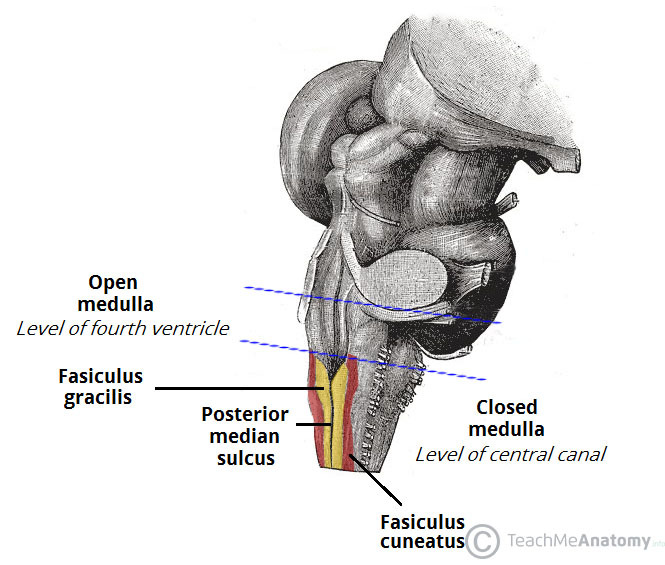 The medulla becomes open when the central canal opens into the fourth ventricle (see Fig. 3). Some features are seen in all three cross sections. Anteriorly we can see the paired lumps representing the pyramids which are separated by the anterior median fissure. Centrally, the central canal can be seen as it rises to form the fourth ventricle in the final cross section. This is the major decussation point of the descending motor fibres. Roughly 75% of motor fibres housed within the pyramids cross diagonally and posteriorly, and continue down the spinal column as the lateral corticospinal tracts. At this level, the central portion of the medulla contains gray matter, while the outer portions consist of white matter. The posterior white matter contains the fasiculus gracilis and the more lateral fasiculus cuneatus. 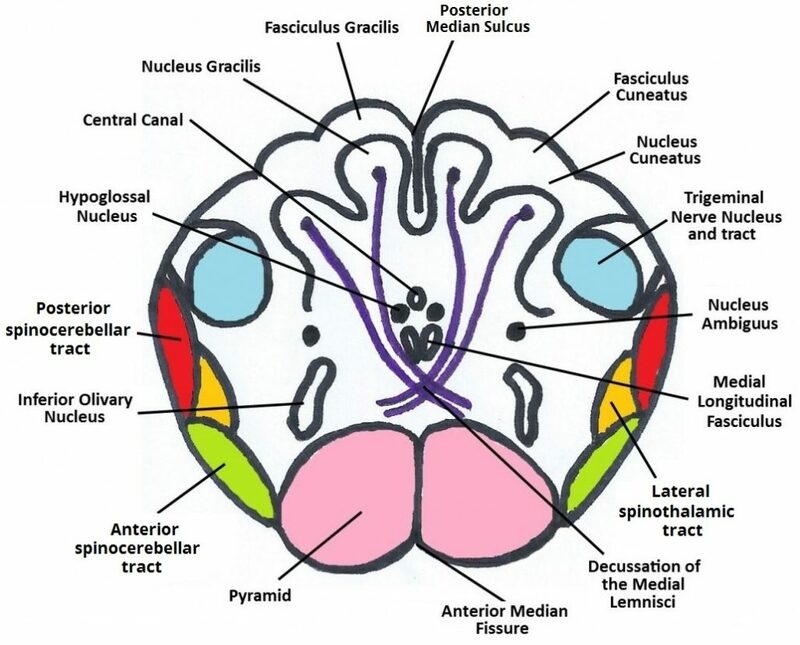 Corresponding portions of gray matter extend to these regions and are the nucleus gracilis and nucleus cuneatus respectively. Unchanged from the spinal cord, the spinocerebellar tracts (posterior and anterior) are located laterally, with the lateral spinothalamic tract situated between them. 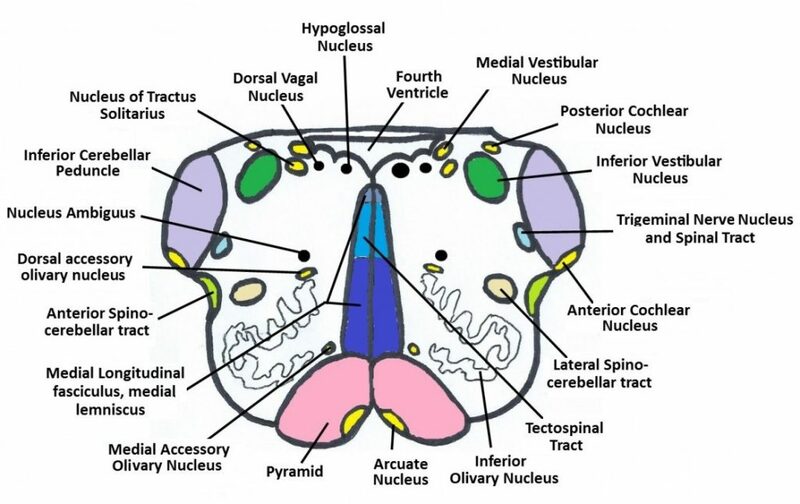 The large trigeminal nucleus and tracts can be found posterior to these tracts. This is a continuation of the substantia gelatinosa of the spinal cord. This level marks the sensory decussation occurs of the medial lemniscus. (Fig. 5). Purple lines have been used to represent the internal arcuate fibres as they run from the nucleus gracilis and nucleus cuneatus around and anterior to the central gray matter to form the medial lemniscus. Lateral to the medial lemniscus, the trigeminal nucleus and spinal tract can once again be seen, as can the spinocerebellar tracts and the lateral spinothalamic tract. 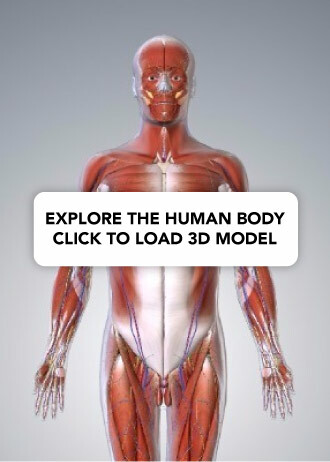 Similarly, the posterior structures are much the same at this level. Centrally, the hypoglossal nucleus and medial longitudinal fasciculus are seen. Moving laterally, the nucleus ambiguous can be seen. Between this structure and the pyramids is the inferior olivary nucleus. This level shows significant change in structure both externally and internally when compared with previous levels. The central canal has now expanded into the fourth ventricle and as such makes this region the open medulla. The large inferior olivary nucleus is responsible for the external expansion of the olives. 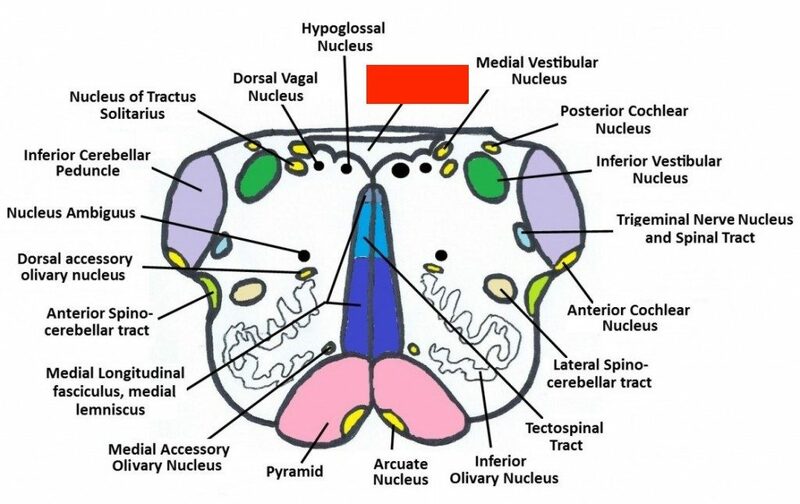 The related medial and dorsal accessory olivary nuclei can be seen medial and posterior to this structure respectively. The large inferior cerebellar peduncles come into view and are surrounded by multiple nuclei. The two vestibular nuclei (medial and inferior) are both found towards the midline while the two cochlear nuclei are found somewhat above and below the peduncles. Now a much smaller structure, the trigeminal tract and nucleus is seen adjacent to the peduncle. The nucleus ambiguous remains as it was previously, while the hypoglossal nucleus has migrated with the central canal posteriorly, joined by the medial longitudinal fasciulus. An additional cranial nucleus comes into view lateral to the hypoglossal – the dorsal vagal nucleus. Moving further lateral, the nucleus of tractus solitarius comes into view. Centrally, the medial lemniscus hugs the midline posterior to the pyramids, as does the tectospinal tract. Between the peduncle and the olivary nuclei resides the lateral spinothalamic tract and the more lateral anterior spinocerebellar tract. The vasculature of the medulla is complex and is dependent on the level being viewed (Fig. 7). The following attempts to simplify this complexity. Despite this it may suffice the reader to know that the vessels that supply the medulla include: the anterior spinal, the posterior spinal, the posterior inferior cerebellar, the anterior inferior cerebellar, and vertebral arteries. 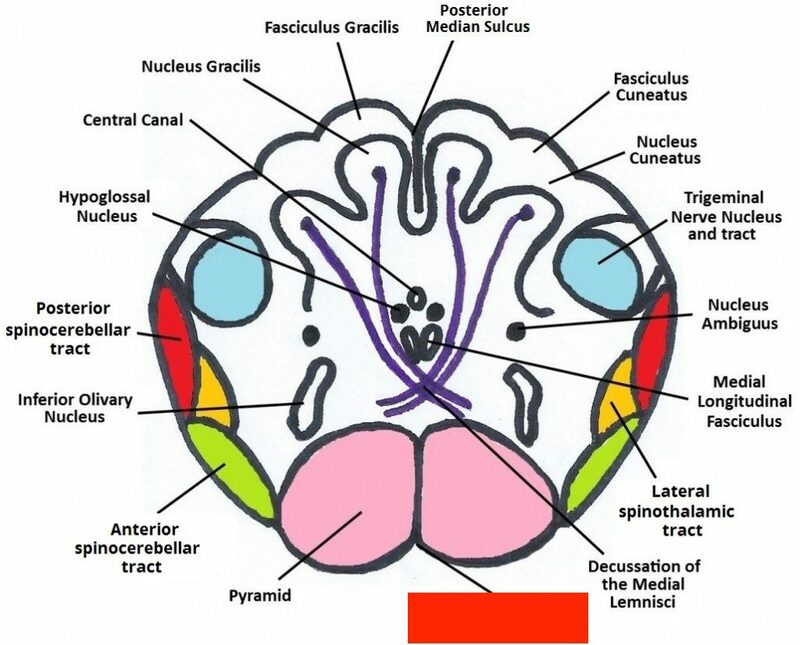 Throughout the medulla, the anterior spinal artery supplies a region beginning at the central canal (or anterior border of the fourth ventricle), and fans out to encompass the pyramids. Below the level of the olives the posterior half of the medulla is supplied by the posterior spinal artery. No other regions are supplied by this vessel. The remaining portions are supplied by the posterior inferior cerebellar and vertebral arteries. 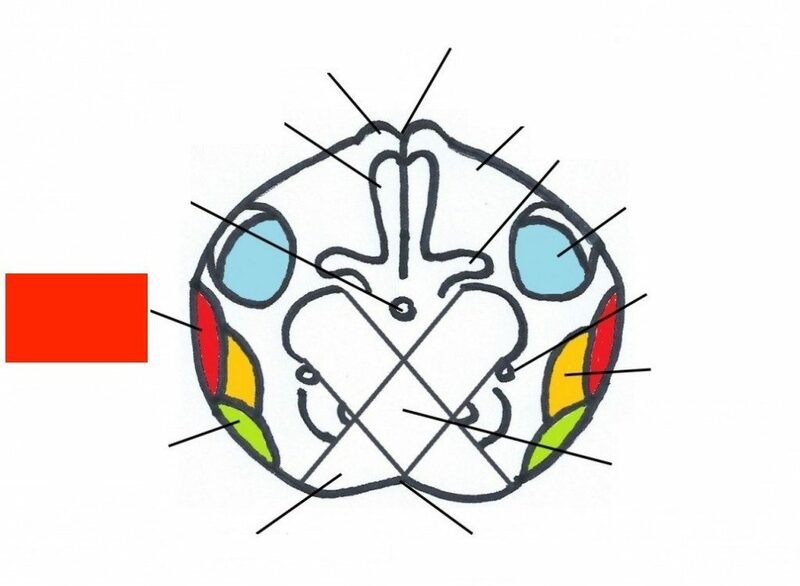 In cross section through the olives both the posterior inferior cerebellar and vertebral arteries take on greater territories posterolaterally and anterolaterally respectively. They continue to do so as the medulla ascends. At the highest point in the medulla, the anterior inferior cerebellar artery supplies the outermost portions of the posterior region. 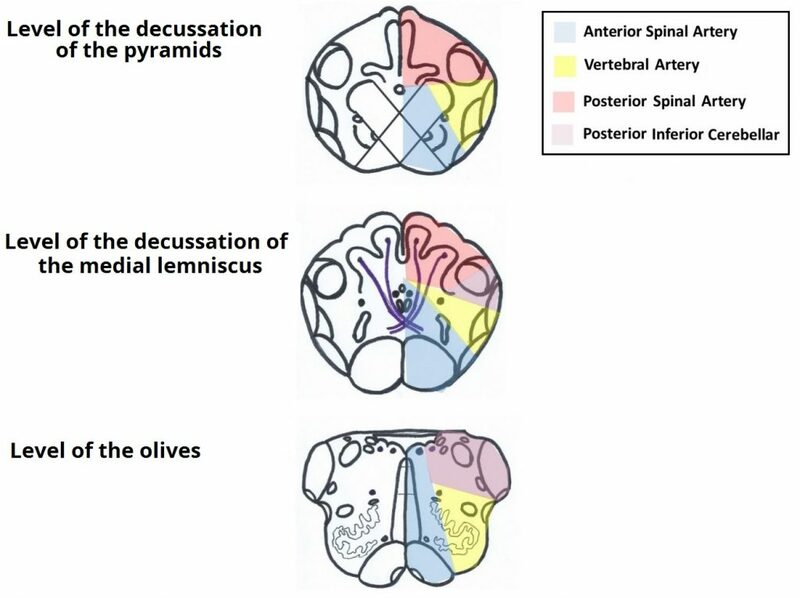 Figure 7: Blood Supply to the Medulla at: Decussation of Pyramids, Decussation of the Lemnisci, and at the level of the olives. What structure is hidden by the red box?